ZixVPM® (Virtual Private Messenger) is a Linux-server-based e-messaging solution for organizations that require a high level of security and encryption for inbound and outbound email communications. ZixVPM works to safeguard an organization's communications and enforce consistent and uniform corporate policy-based email security standards. ZixVPM provides all the benefits of a secure e-messaging gateway without the need to create, deploy, or manage end-user encryption keys and software. With ZixVPM, an organization can set security policies for the entire organization, as well as pinpoint policies for different departments and even different users within those departments. Further, ZixVPM enables organizations to comply with industry regulations regarding transmittal and retention of email. And it does so while providing a secure and private channel for email communications between companies, their customers, and business partners. Once ZixVPM flags an email, it allows various actions, based on the relevant word/phrase that ZixVPM finds and other identifying factors. The filter determines if the message should be encrypted, unencrypted, branded, or bounced. ZixVPM's action in this regard is fully transparent to users. 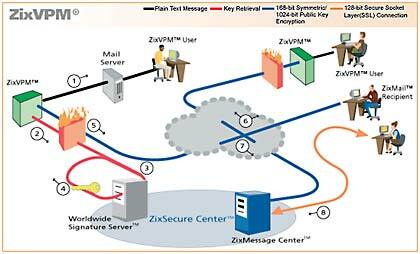 In fact, ZixVPM applies its strongest encryption seamlessly from a message sender and recipient perspective. For searching the full text of emails and attachments, ZixCorp™ chose the dtSearch Text Retrieval Engine. "The embedded dtSearch Engine enabled the powerful scanning techniques in our product, including word stemming, nested document support, and matching on Boolean, numeric, wildcard and proximity expressions," explained Eddy Smith, Research Engineer, ZixResearch Center, ZixCorp. "With dtSearch, the ZixVPM product performs content scanning in the message subject and body text and in any file attachments included in the message." Added ZixCorp's development staff: "dtSearch was extremely responsive in working with us to create a Linux API that would meet our needs." ZixVPM is part of ZixCorp's security suite, enabling organizations to leverage email as a mission-critical application that can be used efficiently and security for even the most sensitive electronic messages and content. As a global provider of secure e-messaging services, ZixCorp providing innovative, cost-effective, and easy-to-deploy solutions that ensure the highest level of security for corporate email and other electronic messages.